Kirara’s frantic scream of panic bounced all the walls and echoed all around her as she continued to stare at her hideous reflection. It was a sunny Saturday morning and Calodrun, a Halloween Bori, was having a cup of Breakfast Tea with Raspberry Scones and clotted cream. He reached over for the newest issue of the Neopian Times, which boasted "ALTADOR CUP PRESS TOUR" across the top. It was all over the news and NeoTV, the Altador Cup, because it was the biggest event of the summer. Calodrun sighed, pushing the newspaper away. Every year, everyone was so excited for the Altador Cup and every year, he wasn’t. He just didn’t really see the appeal – it was too sporty, too noisy, and too spirited for him. He’d much rather stay at home curled up next to a good book or dining at Kelp or the Golden Dubloon. The Altador Cup and its festivities were simply too rambunctious for him. Right as Calodrun decided he was going to have a quiet day at home during his day off, there was a loud knocking on his front door. "Cal! Open up, I know you’re in there!" came a familiar female voice on the other side of the door. It was one of his closest friends, Sqiggleywoo, a Royalgirl Blumaroo. She was a Beauty Contest pageant and avid supporter of Team Roo Island. Calodrun groaned. "Just a minute, Gley!" he called out. So much for his relaxing day off. He got up, slipping his feet into Babaa Pyjama Slippers, and walked over to get the door. The door opened to reveal Gley, who was fully decked out in Team Roo Island gear. She was wearing the Roo Island Altador Cup Jersey, had the Team Spirit Banners strapped to her back, and was clutching a Roo Island Altador Cup Team Yooyu Plushie. She had even painted red, yellow, green, and blue diamonds on her face. A mystery of a missing Amulet... a case in which the famous Detective Tenicie must solve! 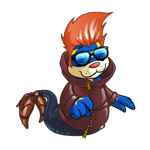 You know you're a veteran Neopets player when.. Tips and motivation for the ultra-impatient wanna-be Kad feeder! What an event! Even my flower is ruined.